The use of aquatic dyes or pond and lake water colorants is an interesting concept that has some value for helping prevent algae and to reduce the proliferation of certain unwanted aquatic plants and slime. These products work on many levels, and as we review the different products you can buy we will discuss the positive and negative aspects of adding pond dyes to your water, but the principal benefit of using a product like AquaShade, BluZyme, Crystal Blue, Bio Black or many of the other brand name mixtures is that you are blocking out the red-orange and blue-violet spectrum from the sunlight. This is natural radiant light in the spectrum that can contribute to the growth of algae; also, by blocking the sunlight we can reduce the sun rays that hit the bottom of the pond, as the water is more opaque, thus we are reducing the warming effects of the sun compared to a untreated pond. Adding dyes to the pond is also for esthetics and often that is the main reason for golf course owners or public pond owners who use it to decide to add the colorant. It can hide the shallow plants and algae that may be growing and in cases of wedding photos or public areas it can turn a muddy gray water into a bright blue or reflective black surface that often looks much better. I often have clients who have small children or grandchildren who want to use the blue mixes for their pond just because the kids don't want to venture into the water when the color is gray and once the BluZyme or AquaShade is added the little ones think the water looks great! Concentrated Lake Dye is the professional strength, concentrated lake colorant formulated to treat commercial ponds, farm ponds, small lakes and other large water features. This is the product we use for all our commercial clients as it offers the best value. This PK lake dye helps filters out the sunlight spectrum that can lead to algae and plant growth in ponds as well as creating an aesthetically pleasing appearance to the water by offering a natural bluish look. This Liquid Lake Dye can be mixed even more quickly and evenly throughout the lake with the use of a fountain, aerator or similar device but will mix naturally within a few hours in a lake or large pond if no circulation system is available. To ensure your pond/ lake maintains a clear blue look, the use of beneficial pond bacteria is recommended in conjunction with dyes. 32 fluid ounces colors 1 surface acre of pond water between 4-8 ft. deep. To ensure fast, even distribution, apply product at multiple points in the pond. Reapply as needed. We recommend purchasing at least four 32 ounce jugs for every acre of pond size simply because we've seen so many clients decide they wanted to add more or less after the first 32 ounces was added. A single application will typically last from 3 to 8 weeks depending on the inflow and outflow of the pond. Always the follow the specific directions on the bottle, jar or jug. Most of these products have no restrictions for use in Canada or the United State of America but most manufacturers suggest not applying into ponds or lakes where there is an outflow into other private or public waters. While most of these products, check with your local store when you buy your pond dyes, are safe for fish and plants, pets and animals they should never be used in an aquatic system that is used or connected to one that is used for human or animal consumption. Certain exceptions apply but be like my Sister used to say, be careful what you put in the water, as come contaminate in the water are not discovered to be harmful until years after. Item # PR-OWD51 (4 x 1 quart supply) Each quart treats one acre up to 8 feet deep. Each quart Treats up to 1 million gallons for 120 days depending on inflow and outflow of pond or lake. Thbest thing about Pond Keeper® concentrated lake dyes and Black Veil® concentrated pond dye is that the aquatic colorant is so concentrated that you only need 1/4 the amount of other pond dyes. One quart will treat 1 million gallons. The black dye is the most natural looking dye as it most mimics the hues and tones of a natural lake. Safe for birds, fish and humans this dye has no algeacides or herbicides. Effect can last for up to four months. Non-toxic. Applying these products in larger ponds can be as simple as gently pouring the concentrated liquid direct from the one or five gallon jugs right off the back of your boat. If you have a fountain or aerator try and get close to it to allow the circulation of the diffuser mixing to do the brunt of the work. Within 10 minutes you should see a distinct mixing. If you are applying into a pond on a windy day it is a good idea to stand upwind and pour the dye at the upwind side of the pond. This will allow the wind to push the dye throughout the pond. No matter how you apply it, when you put it into a large pond it can take up to 2 hours to fully mix and longer if you don't have an aerator. Be careful if you are applying the concentrated liquid near a fountain as the fountain, if the dye gets too close to the propeller intake, can throw very concentrated liquid into the air that could splash into you and literally make you look like a spotted blue Smurf! The use of any colorant should not be considered or seen as a cure-all that will solve all of your pond problems, while it can greatly improve the general quality of the water; as there will be less chance for bottom sediments to be reached by sunlight thus inhibiting algae blooms, it should be one of the tools along with natural bacteria and aeration that make a difference in your pond. Keeping it healthy and clean, and blue, is the goal and we want to help! I've personally been very careful when applying these products yet have always managed to come home after the treatment to find my fingernails looked as if I'd been soaking in melted blue M+M's! On one occasion I literally spilt a half gallon into the boat where I was carefully pouring the liquid near the aeration boil to assist in dispersion throughout the water column and I had blue stained legs that made it look like I had the Mother of all bruises! Once the colorant has dispersed thoroughly it won't stain but in smaller water gardens or whenever you are dumping it directly from the jug just make sure you don't splash it or it can leave a stain. The stains will eventually wear off but on some shorelines having blue or dark black stains on the grass and rocks can be unsightly. Just like many pond additives like bacteria the pond colorants are available in dry pellet or block form. This format really reduces the risk of stains but gloves are still recommended if you are handling and applying. Aquashade Pond Dye 1 gal. This product cannot ship to CT, DC, MA, ME, NJ, NY, VT due to state restrictions. AQUASHADE® is a blend of blue and yellow dyes specifically designed to screen or shade portions of the sunlight spectrum (red-orange and blue-violet) required by underwater aquatic plant and algae growth. This action effectively inhibits photosynthesis in young, bottom growth and may prevent development altogether if applied early enough in the season. AQUASHADE® is primarily effective at depths of two feet or greater. Inhibition of Planktonic (suspended) algae blooms has also been proven. Desirable, floating leaves plants such as lilies are unaffected if they have already surfaced and concentrated product does not contact leaves directly. 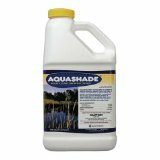 AQUASHADE® is the only 'colorant' product of its kind which is registered by the U.S. EPA for aquatic plant growth control. AQUASHADE® is effective at a low dosage concentration. One gallon treats one acre of water with an average depth of four feet (approximately equivalent to one ounce per 10,000 gallons). Over the years we have tested and evaluated the staying power and effectiveness of many coloring products and have now chosen the one that we confidently recommend based on our reviews of pond dyes and colorants. Many retailers sell five gallon jugs or one gallon supplies at the cheapest price but they are often watered down mixes or require twice as much application to achieve the same results. Even though our 1/4 gallon supply is often more expensive than a gallon of another brand of colorant it depends on the concentration and effectiveness. I have, when buying my flat screen TV, heard the expression: "You get what you pay for" and with this product it is quite relevant! This PondKeeper Lake and Pond Dye has been our highest rated product consistently over the years and we trust it completely.